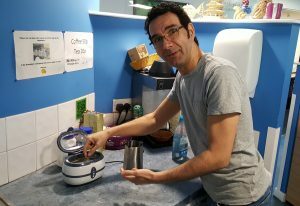 In an unexpected addition to his skill set the School’s resident gadget expert, Marwan Fayed, has started a sideline in cleaning glasses with his new ultrasonic cleaning-thingy, as found in quality opticians everywhere. After a successful demonstration on the Head of School’s eyewear a long queue of glasses-wearing computer scientists formed around the School’s coffee area. Who knows how much this will improve our creativity?